Shoemaking continues to be the work of a family member in many cultures of the early 2000s. Inuit and other circumpolar peoples continue the tradition of footwear production by the mother of the family-the craft learned from her mother and passed on to her daughters, as it has always been. The earliest professional shoemakers can only be supposed from Egyptian friezes where laborers are depicted making sandals, using tools not dissimilar to tools still used by hand shoemakers. However, leatherworkers also used the same tools as the shoemaker, and so it is impossible to define the period in which shoemaking as a singular profession developed. During the Roman Empire shoemaking progressed from artisans working alone in small settlements to congregating in streets near the town's center or marketplace, where guilds became established. 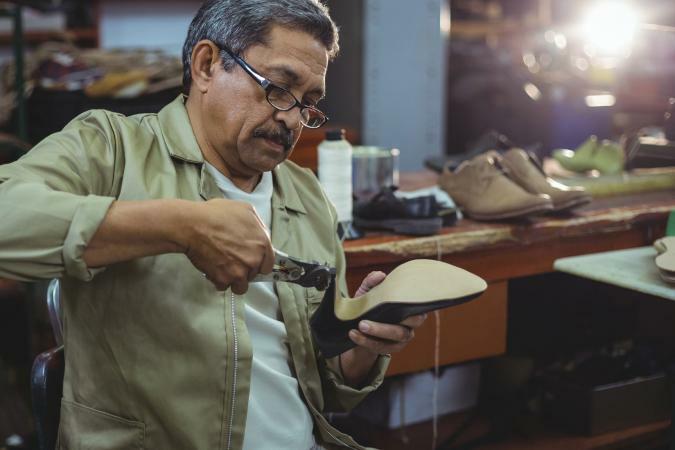 Guilds protected and regulated the shoemakers, their suppliers, and their clients from unfair business practices and pricing, and ensured quality products. Apollo was chosen patron deity of Roman shoemakers, with images and statues of him gracing the entrance to streets reserved for members of that profession. Similarly, images of the Christian patron saints of shoemakers adorned the churches and guildhalls of medieval Europe. During the third century, noble Roman brothers Crispin and Crispinian were converted to Christianity and went to Gaul to preach the gospel, working as shoemakers at night. They were eventually tortured for their faith and put to death. Although the legend is unreliable and Saints Crispin and Crispinian have lost their status of sainthood, they have remained the patron saints of shoemakers since the fifteenth century, and their feast day, October 25, is still celebrated as a holiday for the shoe industry in France. There is evidence that by the fourteenth century, shoemakers were already making footwear for speculative sale, essentially "ready to wear." This was aided by the adoption of standardized measurement. In England in 1324, measurements for distance were standardized under King Edward II. Consistent in size, three barley-corns laid end-to-end equaled one inch and the foot-long "ruler" became the foot measurement of King Edward, the ruler of England. The other standard of measurement was the hand, used since biblical times, and used to this day for measuring the height of horses. A hand equals 4⅓ inches or 13 barleycorns. When a standardized measurement for shoe sizing began in the late seventeenth century, children's sizes were deemed to be less than the measurement of a hand and adult sizes were those over a hand. Adult sizes began with the deduction of 4⅓ inches, so an adult woman's size 4 shoe means it is made for a foot 8⅓ inches long. Under Louis XIV the Paris Point system was standardized as ⅔ centimeter, and became the standard for most of Europe, but Germany continued to follow the English measuring system. By 1400 most large European cities had shoemakers' guilds. This did not include cobblers, who were shoe repairers and not part of the shoemakers' guild. Shoemakers are capable of doing repairs but this is considered inferior work. In England shoemakers were more prop-erly known as cordwainers, and in France as cordonniers, after the fine Cordwain leather tanned in Cordoba, Spain, and imported in great quantities. Their very name suggested the quality of their goods. In the late sixteenth century, welted shoe construction became standard whereby the upper was sewn to a welt with a second row of stitches made through the welt into the outer sole. From this development until the introduction of machinery in the mid-nineteenth century there is very little change in the tools or methods used for shoemaking. And for hand shoemakers, changes in this tradition have been minimal. The tools to achieve this construction consisted of a knife, last, dogs, hammer, awl, and shoulder stick. The first and most important step in making a shoe is to measure the foot accurately, translating these measurements to a corresponding wooden last. The word last comes from the old English word for foot and is the wooden form used as a mold for making the shoe. The last is made to the same shape and size as the client's foot, or a standard last is adjusted adding built-up layers of leather to attain the same measurements. The last is frequently made up of at least two pieces, so that it can be more easily removed from the finished shoe. 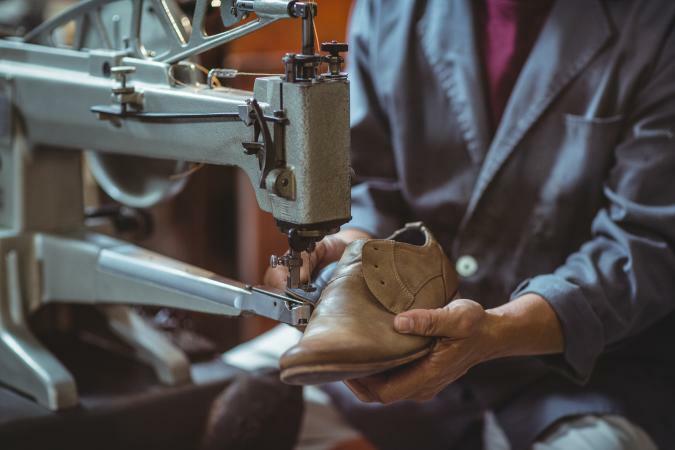 After measuring the foot and translating those calculations onto a pattern, cutting out, or clicking, the leather is the first step in constructing a pair of shoes. The round, or moon knife is an early tool that can be seen as far back as ancient Egypt. Used by most workers in leather until the nineteenth century, the skill to use it to its full advantage was acquired during apprenticeship. Straight knives were also used but it was only with the mass entry of workers into the shoe factories of the nineteenth century that straight knives and scissors were preferred by the less-skilled labor force, resulting in the extinction of the moon knife. Lasting pincers or dogs are used for pulling the top of the shoe, or upper, tight around the last so that it may be secured with tacks to the underside. Most dogs have serrated teeth that help to pull the upper taut and often have a hammer's peen on the other side to set the tacks so that the welted shoe can then be sewn. A hammer is rarely used to set the tacks into the last but rather is used for peening the leather. Once soaked, leather is hammered to flatten the fibrous tissues creating a surface that is more resilient to wear and dampness. Shoes are traditionally not sewn with a needle, but rather holes are created using awls through which a waxed linen thread is inserted with a pig's bristle. The shapes of awl blades vary according to their intended use. A stitching awl has a straight blade and is used for making holes through multiple layers of leather. The closing awl has a curved blade and is used for joining the sole to the upper. The shoulder stick, made of wood, burnished the welt and edge of the sole after the shoe was sewn, trimmed, and waxed. The shoulder stick was displaced in the nineteenth century with the use of heated irons, which did the same job but more quickly. Heels began to be added to footwear beginning in the 1590s. Lasts are required to obtain the correct slope of the sole to accommodate the lift of the heel and as it is too expensive to have a huge inventory of lasts representing the various heel heights as well as for each foot, so most footwear would now be made without left or right definition. This practice of making shoes with straight soles would remain for the next two hundred years, gradually falling from favor throughout the nineteenth century and only finally disappearing in the 1880s. Many surviving examples of lightweight leather and textile footwear from this period show evidence of wear on the uppers where the widths of feet have splayed the upper onto the ground where the sole was insufficiently narrow. However, sturdy leather footwear, like riding boots, continued to be made to order with left and right foot definition for fit and comfort. With standardized shoe measurements well established and the ease of production for shoemakers of straight soles, it became profitable for shoemakers to pre-make quantities of footwear. No doubt when the shoemaker was not employed by client's orders, he created shoes for speculative sale. Extant shoes dating as early as the 1740s and increasingly toward the end of the eighteenth century display sizes written on linings, suggesting pre-made footwear, as well as shoemaker's names printed on paper labels, usually with their address, suggesting an attempt by shoemakers to encourage repeat business. Footwear had become the first ready-to-wear clothing article sold through shoemaker shops, and also haberdashers and "cheap shoe" warehouses, another name for off-the-rack retailers. Standardized measurements ensured a good fit for length, but it would not be until the 1880s that American shoe manufacturers introduced width sizing. Shortages of military footwear, and in fact all leather footwear, were a problem in the late eighteenth and early nineteenth centuries. According to period journals, boots and shoes from fallen soldiers were usually taken for reuse at the battle's end. All sides suffered from a lack of product, and methods to bypass the long years of apprenticeship to make a proficient shoemaker were sought. Improvements in the pantograph allowed for mirror images of lasts to be made proficiently, allowing for sturdy leather footwear to be made economically on speculation. The English developed a sole-riveting machine for military footwear in 1810 and also devised a press for cutting out leather around the same time. The French improved quotas by streamlining elements of construction, using a factory method for cottage production. Americans devised soles attached with wooden pegs rather than stitching, a process that had been used since the sixteenth century for attaching heels and repairing soles. And in 1823, the metal eyelet was introduced, eventually displacing the more time-consuming task of hand stitching lace holes. By 1830, exports of women's footwear from France and men's footwear from England dominated the fashionable marketplace. Shoemaking centers were now firmly established in Paris and Northampton, but the United States, whose shoe industry was centered in and around Lynn, Massachusetts, was about to change everything. Factory-style mass production using semi-skilled work-ers could undercut imported goods and with the American perfection of the lock-stitch sewing machine by 1860, shoes could be made as quickly as the machine-sewn uppers could be attached to the soles. The invention of the sewing machine was primarily initiated by the need for sewing leather, not cloth, more proficiently. Chain-stitching machines were introduced in early French shoemaking factories in the 1830s, resulting in Luddite-like revolts by workers who smashed the machines in fear of losing their jobs to technology. However, chain stitching was found to be more suitable for decorative work than seam construction. It was the American Isaac Singer's patented lock-stitch sewing machine for leather in 1856 that was to begin a series of major changes to the shoemaking industry over the next thirty years. In 1858 the McKay Closing Machine was perfected that sewed the sole to the upper efficiently without the need of a trained shoemaker. The Goodyear welting machine, developed in 1875 by Charles Goodyear Jr., the son of the man who invented the process of vulcanizing rubber, imitated the difficult stitching of a leather shoe through an upper, welt, and sole. Unlike the McKay closing machine, a Goodyear welting machine did not puncture the bottom of the sole, resulting in a suitable walking shoe for outdoor wear. The Lasting machine, invented in 1883 by Jan Matzelinger, copied the multiple motions of pulling leather around a last and tacking it into position-a time-consuming job. These machines, all invented in the United States, secured the American ability to mass-produce footwear, as shoes could now be made at great speed and little cost. By the end of the nineteenth century, American shoes were flooding every market. Even the American idea of shoe boxes allowed for more efficient stock management and exporting of goods to Europe and the rest of the world. The European tradition of hand shoemaking was all but ruined. Some European shoemakers survived the onslaught of cheaper American footwear by catering to the elite, creating footwear of exceptional quality and beauty. However, this worked for only a few small shoemakers. In order to survive, many European shoe companies modernized their factories, fitting them out with the latest machinery to compete with American goods, and many were successful, such as Clarks in England, Bally in Switzerland, Pelikan in Germany, and Bata in Czechoslovakia. Through a changing workforce and insecure economy due to World War I, postwar recession, and the Great Depression, many shoe companies found it difficult to survive. However, a new process for cemented, or glued, soles in the mid-1930s brought production costs down and eliminated the need for many of the American machines. The 1930s put a focus on women's shoes in the wardrobe, now fully visible under shorter hemlines and thus a necessity for the fashion conscious. The importance of style, color, and decoration enabled European manufacturers the chance to regain supremacy. 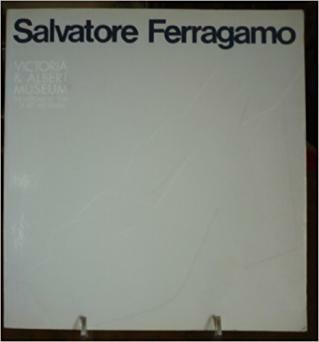 Companies such as I. Miller and Delman in the United States now saw competition from manufacturers such as Charles Jourdan in France, Rayne in England, and Ferragamo in Italy, who catered to a fashion-conscious clientele. World War II changed the focus from style to durability. Shoe manufacturers did not suffer, because they were kept busy producing military footwear and other goods under military contract, but fashion footwear was limited by availability of materials. As part of their postwar recovery, the Italian state aided indigenous shoe companies that were less wieldy than the huge American shoe manufacturers. Undercutting production costs, Italian shoe manufacturers quickly found a niche in the high-fashion footwear industry. By the 1960s French designers were going to Italy to have their shoes made, bypassing their own shoe-manufacturing nationals. Similar sized and modeled companies in Spain and South America with access to cheap and plentiful hides also found success in the 1970s and 1980s, at the cost of American, English, German, and French shoe manufacturers. But the death knell for many American and European shoe manufacturers came in the development of Southeast Asian shoe industries in the late 1950s and 1960s. Cheaper labor costs for traditionally sewn footwear combined with the new slush molded plastic footwear, which could be produced by machine alone, resulted in the most profitable center in the world for the production of sports shoes-the most popular shoe style since the late 1960s. While hand shoemakers still exist in London, Venice, and other locales, their numbers are limited and their clients few. High-fashion footwear is produced with a modicum of skilled labor in the finishing; workers whose greatest skill is computer programming make most of the shoes of the early 2000s. Cost, durability, and branding are what drive footwear production in the twenty-first century. See also Inuit and Arctic Footwear; Ready-To-Wear; Sewing Machine; Shoes; Children's Shoes Men's Shoes; Women's Shoes.